= Kore ohashi de wa tabenikui yo! = It is hard to eat this with chopsticks. I love プリン(=purin), custard pudding! But how am I supposed to eat this with chopsticks? I know many of you are struggling with Japanese particles. But we often omit particles in conversation. We are going to learn this today. = Kono kyoukasho wa wakarinikui. = This textbook is hard to understand. = “Yoroshiku onegai shimasu” toiu nihongo no hyougen wa eigo ni yakushinikui desu. = The Japanese expression “Yosorhiku onegai shimasu*” is hard to translate in English. = Totemo iinikuin dakedo wakarete kurenai? = It’s difficult to tell you but can you break up with me? = Kono tobira no kagi wa akenikui. = This door lock is hard to open. = Kono keitai wa tsukaiyasui. = This cellphone is easy to use. = Chikatestu no naka wa keitai no denpa ga todokinikui. = It is hard to get cellphone reception in the subways. I found out some of you tend to use を ( = wo) (or に ( = ni) in case of 4) instead of は ( = wa). I was wondering why but it’s probably because you learned these patterns. Yes, we have to use an object marker, を ( = wo) （or に ( = ni) here because they are all objects. But of course, we may alternate the particle in more complicated sentences. Will show you more examples later. = She is easy to talk to. = Tonkatsu wa tabeyasuku kitte okimashita. = I sliced the pork cutlet into pieces to make it easier to eat. = Maggie sensei, motto wakariyasuku oshiete kudasai . = Maggie Sensei, please teach us more clearly. = Yuki de michi ga suberiyasuku natte iru node ki wo tsukete kudasai. = Be careful. The streets have become slippery due to the snow. = Kare ga onaji busho ni kite kara hatarakinikuku natta. = Since he started to work in the same division, it has become hard to work there. = Watashi no ressun wa wakariyasui desu ka? Wakarinikui desu ka? = Are my lessons easy to understand? Or hard to understand? = Eh? Sonna shitsumon wa kotaenikui? =What? It is hard to answer that kind of question? Hi Maggie! Thank you for this lesson. you don’t use 簡単／難しい in a compound words. ~するのは／verb dictionary form + のが簡単です。= Doing something is easy. ~するのは／verb dictionary form + のが難しいです。= Doing something is difficult/hard. Thank you so much for your reply. And thank you for this lesson! Is it possible to conjugate やすい・にくい into the past tense? I’ve heard my Japanese teacher say ’この椅子は座りやすい’　how would you translate this into English without it sounding strange? = Kanji wa kakinikui desu. = Watashi niwa kanji wa kakinikui desu. You can also say 私にとっては= Watashi ni tottewa for “for me”. Hello Maggie sensie .. I learned a lot of Japanese through your site . Aregatou Guzaiimashita.! I’m happy to hear you learned a lot here! = Ookina byouki ni kakaru koto wa aru ga naze ka kaze wa hikinikui. Haha yep, I see it’s an idiom, I like it, sounds really strange, to draw a cold or to pull a cold. Anyway I read more often “kodomo ga tabeyasui tabemono”, for example, to say that it’s food that a kid can easily eat so, I guess nikui/yasui is not as much an adjective and has a verb part. I’d have said “kodomo ni tabeyasui” but I understand the ga.
Basically it is possible to use many different particles with V+やすい／にくい depending on the verb and context. 子供が食べやすいように切る= Kodomo ga tabeyasui you ni kiru. このお菓子は子供に食べやすいように作られています。= Kono okashi wa kodomo ni tabeyasui you ni tsukurarete imasu. In the sentence “Kaze wo hikinikui”, the subject is “I” right. If I dont want to bury the subject, how would I say? I just have a small question. 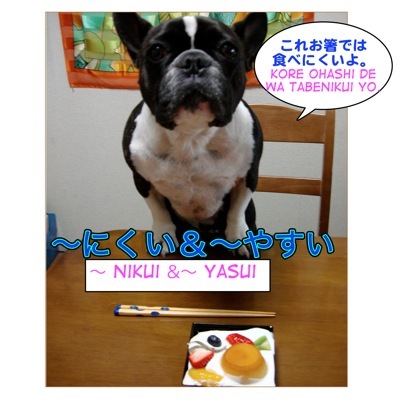 Can I use potential verb with ~yasui/nikui? For example, when I want to say something like “It’s easy to see snow in winter”, can I say “yuki ga mirareyasui”? (it does sound strange to be honest T_T). Hello Jolie, Thank you for your first comment! There isn’t a potential for of ~yasui/nikui but there is a passive form. Ex. 私は３０歳ですが、若く見られやすい。＝I am thirty years old but I look younger. Will show you other example with a passive form. Ex. この自転車は盗まれやすい= Kono jitensha wa nusumare yasui = This bicycle is easy to be stolen. = Yuki wa fuyu ni mirareru koto ga ooi. = Yuki wa fuyu ni furu koto ga ooi. And a little more, can I say “Yuki wa fuyu ni mirarerukoto ga yasashii”? Still I would say 雪は冬に見られやすい doesn’t sound natural. Hello Isay! このサイトに来てくれてありがとう！Thank you for visiting this site. Hope you come back here to learn more! I’m VERY happy to hear that. Feel free to practice with the words that you have just learned here anytime. マギー先生, ただいま! お久しぶりですね? 私は悪い生徒でごめんなさい。o(╥﹏╥)o 最近、毎日仕事で忙しいですから。 でも, 日本語を上達することを一所懸命に頑張ります!